A human being is intended to live in three dimensions. I’m not referring to the three dimensions of ordinary space, and by “intended” I’m not suggesting that someone out there (i.e., god) has designed us with this specifically in mind. More along the lines of the genetic entelechy (inner aim) that drives and guides a living thing toward the ideal of maturity, my theory is that the individual develops – and our species is evolving – into a three-dimensional life according to the entelechy of our human nature. So what are the three dimensions? Let’s start with life in one dimension. One-dimensional life is driven purely by unconscious instinct and guided by the urges and reflexes that keep an organism connected to the life-supply. 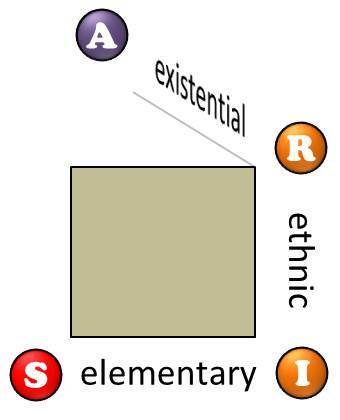 I’ll name this the “elementary” dimension as it concerns what the organism of our body needs to stay alive and grow. It is basic and necessary and doesn’t require us to think, choose, or make decisions. Thankfully, you don’t have to decide when to breathe or how you will digest your food. It’s all taken care of automatically by the unconscious code in your cells, glands, and organs. A human being has an animal nature, which by definition anchors us firmly in the elementary dimension of life. Your body is constantly seeking (though unconsciously, that is, below your conscious attention or control) situations where your biological needs are satisfied. I’ll call the general condition where these needs are connected to the life-supply security (‘S’ in the diagram below). When you were still in the womb, and especially just after you were born, your nervous system was picking up signals and forming an internal impression regarding the provident nature of your environment. To the degree that its basic needs were met, your body established an internal state of security – a visceral (gut-level) sense that reality is safe, supportive, and favorable. Generally speaking, wombs are more secure environments than the space outside the womb, but every human being has to undergo this “fall from paradise” and hopefully reestablish connection to the life-supply. For the rest of your life, your body and nervous system will continuously monitor reality for how providently it supports your needs. 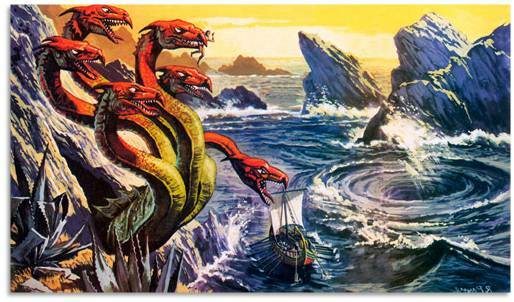 Outside of Eden the supply flow from resource to your need fell short of the instantaneous satisfaction that an umbilical cord provides. So already in your first hour after birth the pang of craving and anxiety broke the spell, causing you to cry out for caring attention. If your caregivers were indeed attentive and responded to your cries with the support you needed, then this twinge of insecurity was resolved and you could relax into being. But no parents are perfect, nor could they be there at the very moment when your need declared itself, which is why all of us get hooked by anxiety to some extent. If we have difficulty as adults relaxing into being (or having faith in reality), then it’s not entirely our parents’ fault because they weren’t completely off the hook themselves (double meaning intended). But your parents were also the first higher powers (or taller powers) who began the process of installing in your spongy brain the cultural codes of your tribe. This is what it means to say that intimacy is a crossover point between the first and second dimensions, from the elementary to the “ethnic” (referring to a primary human group). A human being cannot survive without social support. Those early intimate relationships not only satisfied your physical needs to some extent, but they also forged the emotional and interpersonal foundations of your identity (ego, or social self). As you continued to grow into this second dimension, your tribe gradually trained and equipped you to take on specific roles and responsibilities (‘R’ in the diagram above). To the degree that society is a role play, your occupation and performance within this interactive system was a shared investment of everyone involved. You were expected to abide by the rules that dictated exactly where in the play your part came up (what I’m calling occupation) and how you were to carry it out (performance). Eventually, after numerous roles on a variety of social stages, you were encouraged to take up a more or less permanent occupation in the world of work. As is the case with all your roles, there was a subtle but very persistent pressure on you to identify your self with this work role. The more successful this identification is, the more you are willing to lose and sacrifice on its behalf. Obviously this makes the exit transition of retirement problematic for individuals whose self concept is completely tied to their job or career. And this is where most of us are currently stuck: in the second dimension, struggling to keep our relationships intact as we daily go to work and trade our creativity for a paycheck. A two-dimensional human being is not a totally fulfilled human being, however, which is why so many of us are frustrated, bored, and chronically depressed. The entelechy of our nature compels us to break through to a third dimension, but our present condition has such a grip on us that the upward thrust of our inner growth slams against the ceiling of the conventional world. The “grip” I speak of is also known as the consensus trance, the contraction on consciousness exercised by the assumptions, expectations, and concerns of society. A tribe maintains order by its success in managing the mental limits of its members. If you feel stuck in the second dimension, it’s not for lack of effort on the part of your tribe in providing the intoxicants, prescriptions, distractions, amusements, excursions (as long as you come back!) and fluffy retirement package for sticking it out. Few people wake up from this trance. Sleep-walking through a life of mediocrity is just easy enough to postpone a breakthrough. Religious orthodoxy spritzes a little more hallucinogen into our minds to keep us from causing a disturbance: Just wait. Your reward in heaven will make it all worthwhile. But there are a few – and you may be one of them – who do wake up. They start by asking questions such as “What’s the point?” “Who really cares?” and “Why should I give away one more day of my life to something that doesn’t really matter?” Or they come to certain conclusions like “I’ve been living inside a mass delusion my whole life!” and “Life is short, and then you die.” The truth of this is indisputable: you will die someday, and you don’t know when. If tomorrow is your last day, how does that awareness affect what you do with today? Quite often when people ask themselves this question they break into a new realm of awareness, into what I’ll name the “existential” dimension of a human being. The fleeting character of life and the role play of society inspire in them a focused quest for the really real. This is the search for authenticity (‘A’ in the diagram”) and an authentic life, for the genuine ground of reality. Finding it around you and inside yourself does not constitute an easy answer to your quest(ion) after the really real. You will still die, and it could be tomorrow. But now – and that’s a key existential word – you have the opportunity to be spiritually grounded, deeply centered, fully awake, and completely alive. As each moment unfolds like a flower, you draw its beauty and fragrance into every cell. Even if it’s painful and more like a thorn, you can be there and touch reality with open awareness. The existential dimension of life is therefore about being present and responding in wonder, mindfulness, and gratitude to the present mystery of reality. It doesn’t throw off responsibility, renounce intimacy, or abandon security; but it may motivate you to quit your job for something more creative and true to your soul, leave a relationship that’s abusive or dead, or take a risk for the life you really want. My “Conversations” with recent philosophers, theologians, and mystics over the past year have helped me reconsider some terms we commonly use in the investigation of what makes us human. The longer history of higher thought has continuously required us to make distinctions in what we had earlier grasped as “one thing.” The words individuum and atom once named basic and unbreakable units of reality. Now we have created numerous and sometimes competing disciplines for exploring the many parts of the individual and the atom. Of course, these many parts can become disconnected in our minds, giving rise to further specializations that eventually leave us with so many scattered pieces that we might abandon all hope of ever recapturing a sense of the whole. This “sense of the whole” is what Abraham Heschel meant by wonder. Somehow, after or on the other side of all this mental business of dividing and defining reality into its many pieces, we need to pause and re-member – put them back together so we can appreciate the unity of being. In that spirit, I want to pause and reflect on that fascinating bit of reality called a human being. And I want to engage this reflection in light of the philosophical commitments of perspectivism, constructivism, evolution theory and metaphysical nonrealism. These were commitments of my Conversation partners, and they are major features of our emerging postmodern worldview – which is still being worked out, by the way. 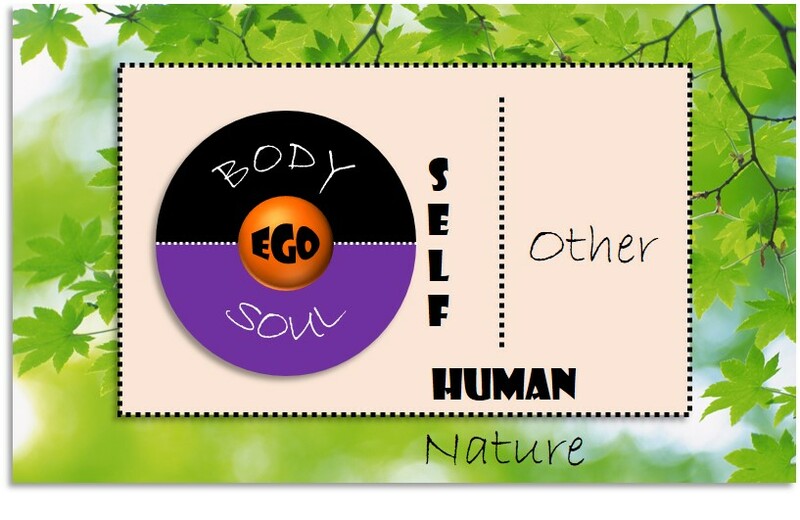 A human being is a trinity of body, ego and soul. Each of these terms names a particular standpoint in reality, a certain mental location, as it were, where we can take a perspective on things. They are not pieces of a human being – as if one could be removed, lived without, or left behind with a human being still intact. Rather they are aspects or dimensions, distinct ways by which our existence as human beings is expressed and extended into reality. I’ll begin with the body, for that is where we all begin. Also called our “animal nature,” body is the organismic basis of life. It is a complex organization of vital impulses that I call “urgencies” – urges which have evolved around the need to convert energy from the environment (sunlight, water, nutrients) into biological fuel. As a biological organism, the body has evolved ways of adjusting itself and adapting to its surroundings so as to maximize the efficiency of this energy conversion. As a dynamic energy converter, the body is an organic intelligence that carefully balances its own internal state with the changing conditions of its environment. This orchestration of maintenance (state) and adjustment (reaction) keeps a human being in providential niches where life can be sustained and supported in growth. If all that sounds coldly impersonal, that’s because it is. 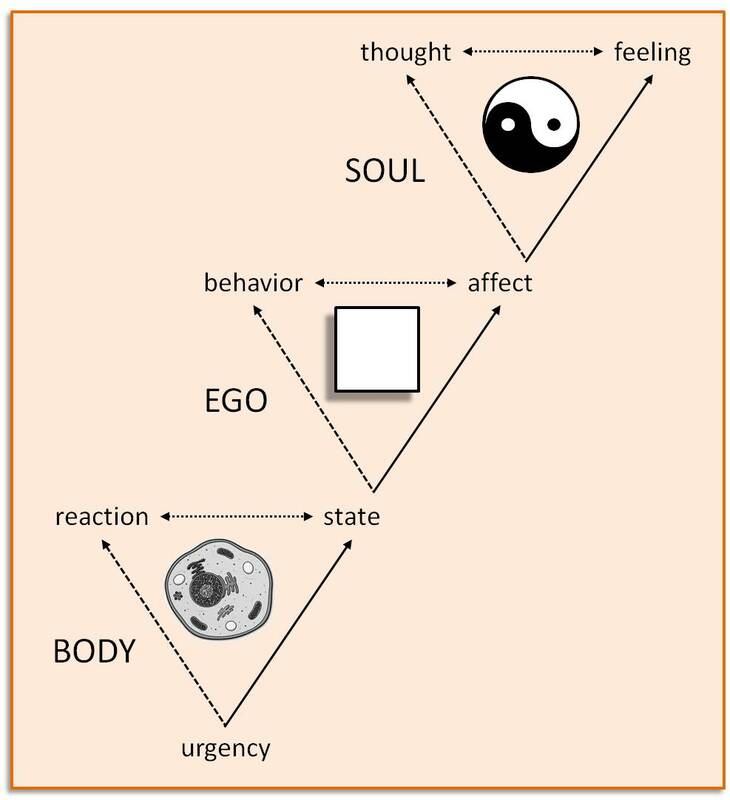 We now know that body precedes the personality and serves as the biological basis to the formation of ego. Ego, then, is a second standpoint in reality, extending out of the body and engaging the world at a higher level. This doesn’t make it better or more essential to what makes us human – although it seems right to acknowledge ego as an evolutionary stage beyond the vital urgencies of the body. 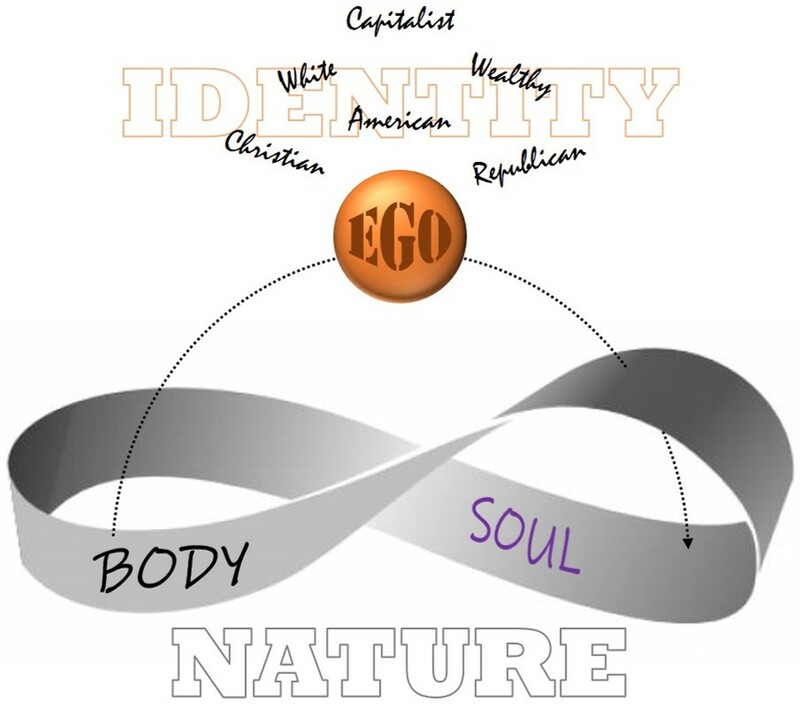 Ego refers to the socially constructed identity of a human being. In order to become “one of us” at the tribal level, each human being must gain sufficient liberation from the urgencies and compulsions of biological life. The tribe helps this to happen, by giving the child an alternative set of directives, which Nietzsche called “morality.” Morality is necessary to the formation of identity, providing a counter-force to the animal instincts and redirecting (but also repressing) these impulses into socially acceptable behavior. 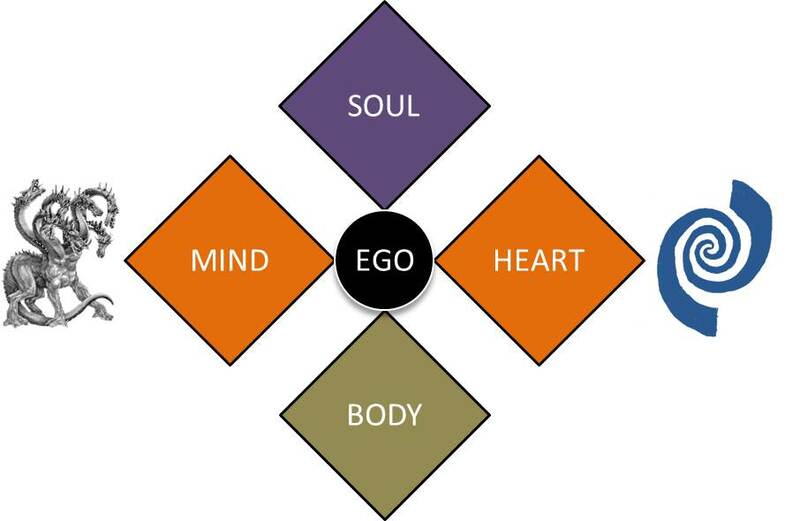 The body’s internal state serves as the subjective reference of the ego’s stand-point in reality. If the body is anxious, the ego says, “I am afraid.” If the body is incited to aggression, the ego says, “I am angry.” If the body is satisfied and content, the ego says, “I am happy.” The “I am” in each case exposes a tendency of the ego to identify with the body’s internal state. Otherwise, the ego might say something like, “I feel afraid” – which demonstrates an ability to distinguish between a subjective feeling and its underlying biology. 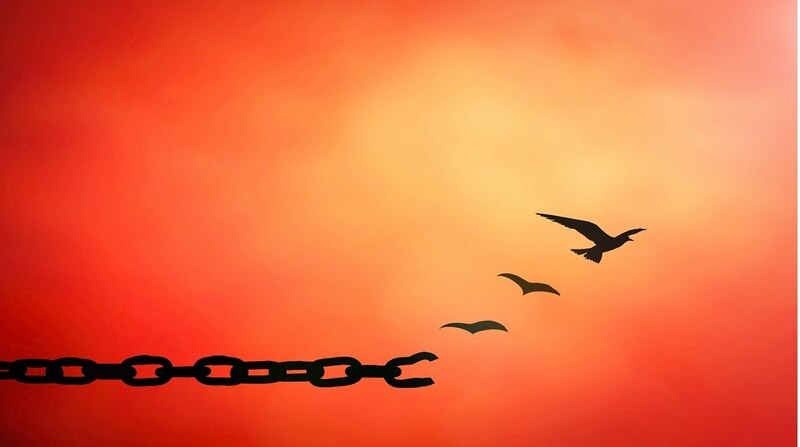 This ability to separate affect and behavior provides an important gap that the ego enjoys as freedom – the freedom to choose a course of action (or restraint) above the compulsions of the body’s animal nature. Not everyone is successful arriving at this point, as evidenced in the proliferation of neurotic disorders where the individual gets stuck in overwhelming affect states and compulsive behaviors. But if – and this is a very big if – an individual is able to gain sufficient liberation from reactive impulses and adequate moral guidance from the tribe, another standpoint in reality is made available. This is what we call the soul. My challenge here is to understand soul without relying on metaphysical realism. It is becoming less meaningful and relevant these days to regard the soul as some kind of ghost in the body, which can carry on perfectly well (or even better) without the burdens of mortality. Metaphysical realism treats the soul as a thing, separate from and independent of the body. This thing is believed by many to not only survive the body, but to live forever. As we should expect, the tribe has exploited this belief for the purpose of enforcing the moral conformity of the ego. Just as ego uses the body’s internal state as the basis of identity, soul is a still-higher standpoint in reality where feeling and thought differentiate out of this subjective affect. The ability mentioned earlier, of distinguishing between “I” and “this feeling I have,” is a sure sign of the individual’s transcendence of ego. But again, transcending only means “going beyond,” not leaving behind. Once lifted above the need to either protect or promote identity (ego), affect can differentiate into even subtler experiences, which have produced great works of art and other cultural achievements of our species. Feeling and thought are the Yin and Yang of the soul, with each creative expression adding spread and height to the growing tree of wisdom. They complement each other, deepening and expanding in creative partnership. Only ego sees them as opposites, where one must win and the other lose. Soul joins the dance, where the push and the pull, the rise and fall, the silence and the sound come together, only to spin out again. In that moment – yes, in every moment, but now in full mystical awareness – the soul is in the presence of mystery. This is the place of inspiration (feeling) and enlightenment (thought), where all the “parts” are suddenly seen – in a sustained flash of intuition – as rooted in a common ground, as diverse fruits of a single tree.